It is very rare in today’s advanced technology environment that we see major performance and price breakthroughs. Optoma’s UHD65 projector could be one of those breakthroughs. 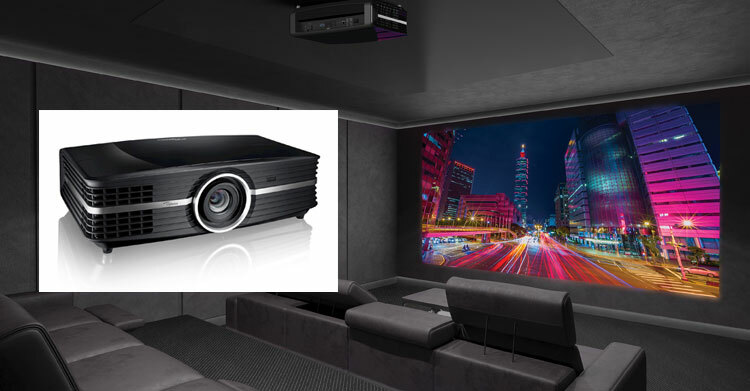 With good quality, high contrast, HD projectors now available in $2,000 range, 4K projectors have kept their distance with true 4K projectors starting in the $8,000 range. Is it really possible that a 4K projector, under $2,500, could be good enough to give those 4K projectors, that are $8,000 or more, a run for the money? We’ll be comparing four projectors, Sony VPL-VW365ES ($7,999), Epson LS10500 ($7999), Epson 4040 ($2,699) (also similar to 5040UB) and the new Optoma UHD65 ($2,499). We’ll compare color, real world contrast, brightness or light output, and detail. 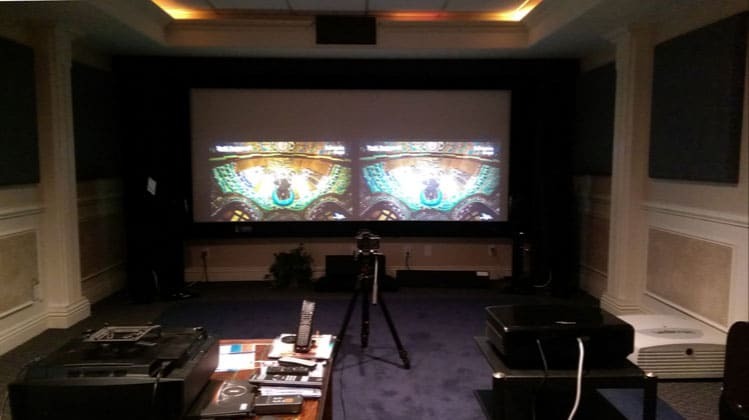 Instead of just doing measurements and white balance calibration we’ll be doing a basic calibration for contrast, and brightness, and as close to the D6500 standard that these projectors will do – with basic end user settings so color will be at the out-of-the box-best for each projector. Each projector will be compared to the UHD65 in terms of side by side performance with images designed for color, contrast and detail evaluation as well as 4K UHD Blu-Ray footage. Both the Epson 4040 and the 5040UB projectors have 4K enhancement which means that although they will accept 4K UHD via HDMI 2.0 and HDCP 2.2 the projectors will actually display the signal at twice the number of pixels of HD. So, not full 4K UHD, but better than HD and to most viewers at typical viewing distances it looks like 4k UHD. The Sony VPL-VW365ES is native 4K and is one of the best, if not the best, home theater projectors under $8,000. But resolution is only part of a good image, sharpness, contrast and color are also key to great picture. The Epson and Sony projectors use 3 LCD panels – so color is generally very good. The UHD65 uses a single chip DLP. Many manufactures do not divulge which color wheel (which determines the color saturation vs. brightness) they use for their DLP projector. Some are optimized for Brightness (RGBW), some color accuracy and saturation (RGB,) and some do a balance (RGBYC). The UHD65 uses a RGBRGB color wheel so color saturation is about as good as a single chip DLP can do. This also explains the trade off in brightness vs color. Perceived sharpness and detail is a combination of the actual resolution, lens sharpness and the electronic detail processing. It also is affected by the alignment of the red, green, and blue chips in a 3-chip projector design. The Epson has very good image enhancement with the ability to make both 4K UHD and HD look very sharp and detailed. It also has fine alignment adjustment for minimizing color alignment. The 4K enhancement does improve the smoothness and perceived quality of the image. The Sony is native 4K for the full 8 mega pixel image. If 3 LCD chip designs, such as the Epson (conventional trans-missive LCD), have a drawback, this is it. DLP chips are generally superior to LCD when it comes to contrast as the deep blacks are deeper and less milky looking. However, recent advances by Epson and Sony have resulted in reflective LCD chips which improve contrast considerably by improving deep black levels. In the same or closest setting of color accuracy. Projectors can typically lose up to ½ or more of their brightness in order to reproduce the most accurate color. So setting the projectors to as close as settings will allow to 6500 kelvin degrees is important in making any comparisons. It should be noted that we purposely did not do a deep certified color calibration as we felt most people in this price range, of under $2,500, would most probably not spend the $300 to $600 for professional calibration but would improve the color accuracy. With lights on, this shows how images are shown side-by-side – both before and after basic calibration. This entry was posted in AV Solutions, Home Theater and tagged 4040, 4k, 5040UB, color, comparison, Contrast, detail, DLP, Epson, home theater, home theater projector, LCD, LS10500, Optoma, projector, projector comparison, side-by-side comparison, Sony, UHD, UHD65, VPL-VW365ES.